“I found the lump twenty minutes before breakfast, three weeks after my marriage broke up,” Katherine Russell Rich’s book opens with a slap in the face. And it continues at that pace, slap after slap as the author unfolds her journey through an Inferno that she calls Cancerland. We meet doctors who hover on the brink of malpractice suits and who are unwilling to believe that any woman in her thirties could possibly have breast cancer. And there are co workers who avoid anyone who reminds them that they may one day die. And relatives who cannot mention the ‘c’ word. And friends who are as young as Russell Rich and therefore cannot deal with the reality of cancer. Despite the fact that Russell Rich documents the lonely no man’s land of a cancer sufferer vividly, the book is not morbid or dripping with self pity. Instead it’s often tongue in cheek. For example, she refers to her ex-husband Diego as a Ricky Ricardo in a bad mood. And she looks unflinchingly at the different kind of emotions that contact with a cancer sufferer provokes. “‘People don’t want to hear about it,'” Rich’s scandalous great-aunt who also survived cancer says. And that she discovered was true, as her editor refused her assignments and gradually eased her out of her magazine job. While the cancer taint affected any doctor that she met including her ophthalmologist who looked at her conjunctivitis and told her kindly that she did not have cancer of the eye. 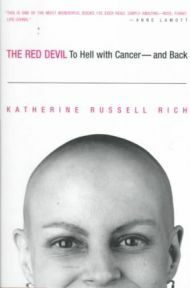 The title of the book comes from the nickname given to her chemotherapy medicine Adriamycin and she explores how cancer makes people “behave like more concentrated versions of themselves. For better. For worse,” as she grapples to find meaning in her disease even as she loses her hair or vomits for eight hours with her ex-husband by her side. One lesson that she learnt was that it was important to stay connected to the everyday world and not lose perspective. “Cancer,” she writes, “is infantile in its demands. By demanding constant vigilance, it makes you self-absorbed.” And the result of self absorption is loneliness. Many readers will refer to Elizabeth Gilbert, especially when confronted with passages like that of a hovering violet light that strikes Russell Rich with the force of “sudden, disconcerting wisdom.” “Sick of being indebted to tragedy for definition, of regarding it as predictive,” she decides to look on the positive side and predict a happy outcome against all odds. Told that she had two or three years to live, all she wanted was her ordinary life back with no grand last wishes. And she struggles desperately to achieve that. Russell’s Rich’s style has no flourishes – it is simple, hard hitting and gets its message across very readably. In the end the book is a very brave account of dealing with cancer and managing to survive against all odds – Russell Rich is today in remission and beset by the normal problems of life. The book won a New York Foundation for the Arts Award and that is hardly surprising given its importance as a memoir. No Comments on "Against All Odds"